I have heard somewhere that your volume was attacked by the teeth of certain hounds, but that you defended it valiantly with staff and voice. This did not surprise me, for not only do I well know your ability, but I have learned from experience of the existence of an insolent and cowardly class who attack in the work of others everything which they do not happen to fancy or be familiar with, or which they cannot themselves accomplish. Their insight and capabilities extend no farther; on all other themes they are silent. It is almost impossible to talk about Petrarch without mentioning Boccaccio. Giovanni Boccaccio was born in 1313, in either June or July out of wedlock to Boccaccino di Chellino and an unknown woman. In 1319 Boccaccino di Chellino marries and Boccaccio's stepbrother, Francesco is born. The work he is perhaps most known for is the Decameron (which means "Work of Ten Days") 100 stories told over 10 days by 10 people escaping from the plague. It was one of the final stories The Tale of Griselda which Petrarch read and then translated into Latin. It was composed between 1349 and 1353. Although he is first exposed to Petrarch's works in 1333, it isn't until 1350 that the two of them first meet face to face, in Rome. By that time Boccaccio was the undisputed leader of Florentine literary culture. Under Petrarch's influence, he turned increasingly away from vernacular fiction (Italian fiction) in favor of Latin scholary works. He took lessons in Greek, solicited translations from Greek texts, and in 1360 successfully worked to establish at Florence the first chair of Greek in non-Byzantine Europe. In 1373 the citizens of Florence chose him to give the world's first lecturae Dantis, probably the first lecture series ever dedicated to the exposition of a European vernacular text. The two formed a friendship which lasted their entire lives, so much so that Boccaccio is the recipient of a large number of letters which appear in Petrarch's collections. There are many unknowns in history, and one of those unknowns when it comes to Petrarch is how much is real. Although Petrarch tells us he was crowned poet lauriet in Rome, there is no other account for this in history, except in the writings of Boccaccio. 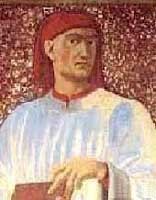 Boccaccio died on December 21, 1375. Together Petrarch and Boccaccio could be called the founders of Humanism. Besides the time they lived in and their contributions to the world they also shared many similarieties. They both fed of each other for inspiration and support through the years as both lost many friends during the plague. They both had loves which they lost to the plague as well, Petrarch's Laura de Noves and Boccaccio's Maria d'Aquino.